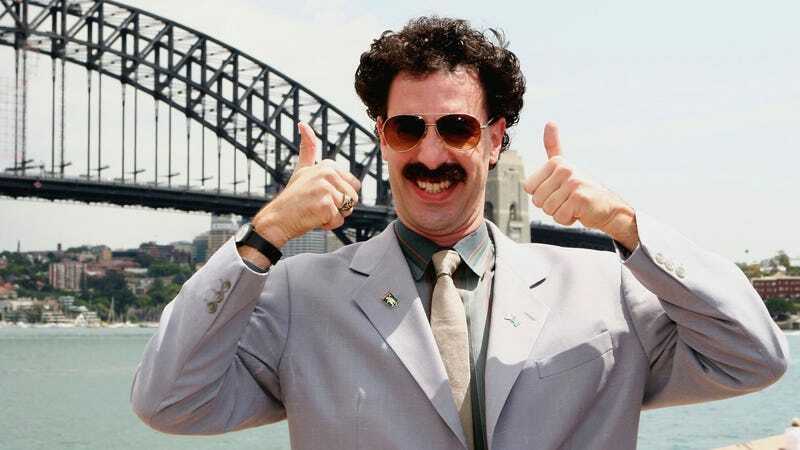 Borat is funny, but Sacha Baron Cohen’s 2006 satire has, over the years, made monsters of the nation’s dads, who can answer even the most innocent of questions with a sloppily hoarse “very nice” or “my wife.” Not even the Australian Prime Minister Scott Morrison is immune to the joke’s (?) powers, as he recently dropped a few of the former in parliament, signature thumbs and all. What’s wild is that Morrison is hardly the first Aussie lawmaker to rely on the 13-year old film for policy-related yuks. Per The Guardian, Labor MP Ed Husic previously channeled Sacha Baron Cohen while talking about the country’s internet. “We’ve gotten to a point where our download speeds in Australia are slower than in Kazakhstan,” he said. “We have Borat broadband in this country.” Ugh. More often than not, pop culture and politics make uneasy bedfellows. Mike Huckabee, for example, is a lot more comfortable using it for racism than for crafting Adele parodies. Our current president’s brain breaks every time he’s forced to discuss a musician or movie. Ted Cruz’s desperation, meanwhile, grows roughly three sizes every time he drops a Simpsons reference. Even Democratic upstart Beto O’Rourke’s numerous references to his punk rock past come across as pandering.